Bored tunneling by using a Tunnel Boring Machine (TBM) is frequently used for excavating long tunnels. Tunneling Boring Machine (TBM) are all the time more used for tunneling with difficult and complex geological environment, including rock and soil mixed and interfaced grounds, bursting rocks, squeezing and swelling grounds, highly rocks fractured , shear and fault zones and grounds under high in situ stress and water pressure. 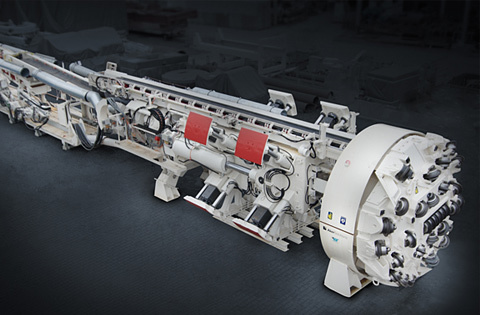 Tunnel Boring Machine may be suitable for excavating tunnels which contain competent rocks that can provide adequate geological stability for boring a long section tunnel without structural support. However, very hard rock can cause major wear of the TBM rock cutter and may slow down the progress of the tunneling works to the point where TBM becomes useless and uneconomical and may take longer time than the drill and blast tunneling method.